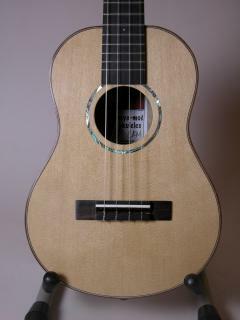 "Whenever I take my Mya Moe ukulele out of its case, every one oohs and ahhs! 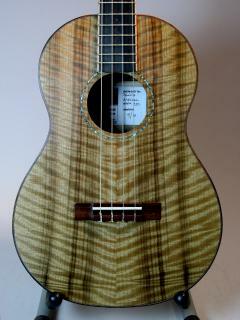 When I play my Mya Moe ukulele, you can hear a pin drop! Thanks to Char and Gordon, I have found an instrument that will help me grow as a professional musician. 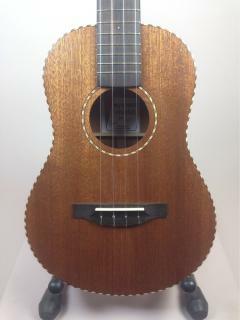 My only concern is that this ukulele might be a better singer than me!" My name is Danielle. I write songs about things I feel, things I've seen and things I wonder about. I write about things I know and things I don't know. 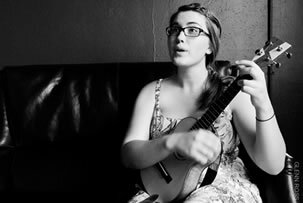 I write these songs using my astonishing wit and through the help of wikipedia, and other untrustworthy internet sources. I've been writing since I was a kid (notebooks date back to 1997), but only began performing in front of people in 2006, playing mostly open mic nights gaining confidence as a performer and a small, but loyal crowd of listeners. In 2009, I began my career as a full fledged professional musician, playing shows around the U.S, gathering a large numbers of subscribers on youtube and crossing my fingers that it'd all work out. I love to sing and to write and to perform. If I get to do these things I am happy. I am successful. To me, it's as simple as that.